Youth Workers – Are You Giving Parents Bubbles? 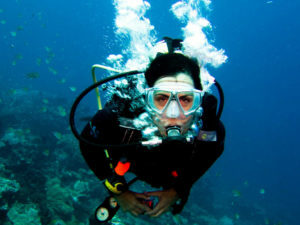 When scuba divers are down deep, it is easy for them to become confused and disoriented. Since water diffuses light, divers often find themselves surrounded by illumination, making it difficult to discern which way is up. Feeling weightless and without a sense of gravity contributes to this confusion. The only way to distinguish up from down is to watch the direction in which their air bubbles travel. Divers who lose their sense of direction risk drowning if they trust their inner senses more than their bubbles. They are taught early on that no matter how they feel, no matter what they think, their bubbles are always right. I know a mother who is confused and disoriented as she attempts to tackle the task of being a Christian parent. She desires to be a good and Godly mother. Consequently, her shelves are filled with parenting manuals and books that she has read from cover to cover. She has attended the many parenting seminars offered in her local schools and community. She even makes a point of going to other mothers to ask for guidance and advice. She tracks with several online parenting blogs. No doubt she has learned a lot. But she is the first to admit that she has been left confused by exposing herself to dozens of different parenting philosophies and techniques. She needs to learn that no matter how she feels, no matter what she thinks, no matter what subjective advice any book or parenting expert gives, the Bible describes things accurately and clearly. Like the scuba diver’s bubbles, the Bible is always trustworthy and right. Everything else must be evaluated, considered, and judged in light of God’s Word. And this, youth workers, is where you come in. The reality is that most Christian parents today are not engaging in the spiritual discipline of Bible study that will enable them to understand who they have been called to be as the ones primarily responsible for the spiritual nurture of their children. And, parenting in today’s rapidly changing world is anything but easy. Because you and the parents in your ministry share a common concern and love for their kids, you can and must step into the gap to provide ongoing learning opportunities for parents where they can learn the Scriptures alone and together, and then engage in helpful support groups where mutual encouragement takes place. Here are three simple starting steps that I believe every youth worker must take to launch parents on the journey of engaging more regularly and deeply with God’s Word. . . Begin a parenting class. Parents are hungry for guidance and direction. You are uniquely positioned to facilitate the launch of a weekly gathering of parents where they can learn their craft. In most cases, youth workers shouldn’t be the ones teaching the class, especially if you don’t have teenagers and parenting experience of your own. However, there are people and books that you can use as teaching resources. (See below for a list of some of my favorites). Social media sharing. One of the great blessings of technology and social media is the ability to find and share incredible resources. Youth workers should look for, find, and share insightful posts, podcasts, and video clips that will take parents deeper in their understanding of God’s Word, specifically as they pertain to parenting and the youth culture issues of the day. Concerned parents are always asking “How do I. . . ?” questions. Mine the wealth of information that’s out there and point them to biblically based answers. (Again, I’ve included a couple of suggestions below). Suggest and provide Bible study resources. Why not find someone in your church who cares deeply about parenting who can underwrite and fund a gift of Bible study materials that you can give to every parent? Look for helpful prayer guides, daily devotional books, Study Bibles, or other resources that a parent can keep on their nightstand? From the moment they are born, our children need parents who tune themselves in to the most reliable source of parenting information and instruction. God has given us the Bible to guide us through these difficult and confusing days in our broken, confusing, and disorienting world. As a Christian parent, my approach to parenting should be informed and guided by God’s Word. I must study the Bible with diligence on a regular basis, discovering how it speaks to the values, attitudes, trends, and messages of contemporary youth culture. Through going deeper in the Scriptures, God begins to reveal to me the character traits and attitudes that God calls us to exhibit in our families and other interpersonal relationships. On a personal note, I have found that my investment of time in knowing God’s Word has been the very thing that has guided me through the deep waters of parenting. I have not been a perfect parent and I have not raised perfect kids. We have experienced the blessing of suffering due to circumstances and poor choices. While these times have been painful, they have also been times of great blessing as we have seen God be true to his Word as he parents us while we sometimes helplessly parent our own children. Through it all, the bubbles of God’s truth always rise to the top, giving us a clear sense of where we are and where we need to be. Some of my favorite parenting books for a parenting class. . . Some Free Resources from CPYU that you can share via social media. . .
← The Power Of Teachers. . . It’s Back-To-School. . .